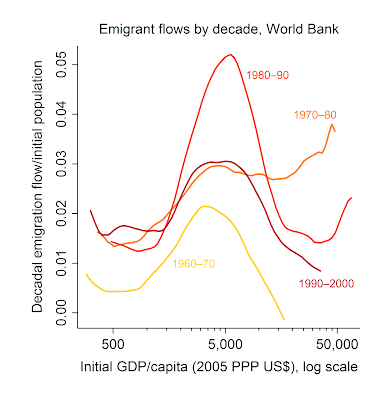 Iterative Adaptation: Does development increase/decrease emigration? Our intuitive understanding is that people emigrate from poor and developing countries to developed countries, in search of better opportunities. So, once these countries develop, emigration slows down. It's a reasonable hypothesis, except that there's a small twist to it. Emigration actually increases in short term, as the country develops, till a threshold income level. It decreases only after that. Michael Clemens constructed these graphs from emigration data. 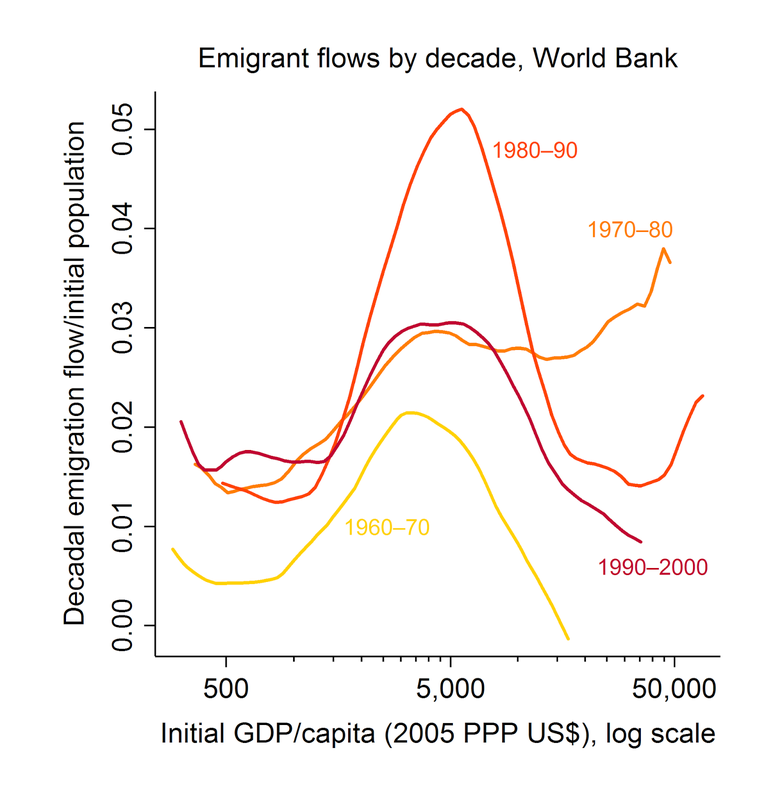 Emigration follows an inverted-U pattern. Emigration increases till the GDP per capita is about $6000-$8000 (PPP), after which it decreases. There can be several reasons behind the inverted U pattern of emigration, where emigration initially increases with development. People can access more information, as countries grow.. Between one-third and one-half of the slope of the increasing segment is due to the changing skill composition of working-age populations, and another third is due to changing network size. The microeconomic channel (including financial incentives and constraints) only accounts for one fourth of the total effect in low-income countries, and for less than one fifth in lower-middle-income countries. In other words, skill acquisition, along with network effects are the major reasons for the initial increase of emigration, as countries grow. Countries might have to accept the inevitability of this emigration pattern. One must also note that this emigration of high-skilled workers need not necessarily harm the country. It might infact be beneficial as the evidence suggests. Instead, obstructing emigration might turn out to be harmful. PS: Regarding India: India's GDP per capita is $6,266 (PPP) in 2016. If India were to follow the same pattern, we should see a decrease in emigration.